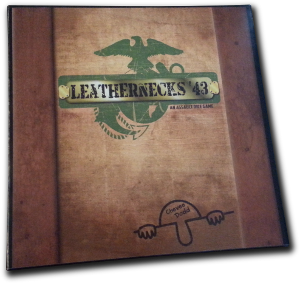 Leathernecks ’43 is a fast-paced dice game which mixes push-your-luck elements with important tactical decisions. You control a squad of Marines advancing up the beach towards enemy machine gun positions. Rolling the soldiers on your dice allows them to advance, but you might also roll machine gun fire which slows them down. 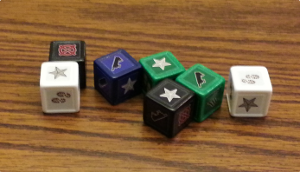 Each suppressing fire result pins down one of your soldier dice and if you accumulate three suppressing fires in a single turn, your entire squad is pinned down and none of your soldiers advance! If you’re lucky, you can use smoke grenades to avoid the fire and push your squad up the beach. Your goal is to assault the bunker, but you also need to outpace your opponent’s soldiers! At the end of the game, you score bonus points if you moved your different soldiers farther than your opponents, so you need to pay attention to what they are doing! After hours of intense naval bombardment, the Marines of the US Second Division sat some 500 yards from shore, their landing craft impeded by the shallow reef. As the artillery ceased, it was time to take to the beach in what would be the deadliest 76 hours in the entire Pacific Theater of World War II. Leathernecks '43 is a re-theme of the Princess Dice game I designed for my daughters. You can read more about that project at the Princess Dice page.